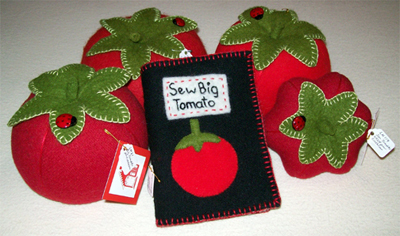 While my readers patiently wait for me to learn the computer part of getting stuff up and into my store on Etsy, as well as entering my own blogs, I want to tell you why my large plump tomato pincushions are one of my favorite pincushions. This is a true story and was written many years ago after we had moved from Denver, Colorado to Orwell, Vermont. We were seeking a less stressful way of life, though little did we know that we were simply trading our stresses. Leaving behind city ways, rush hour traffic, a job with good benefits, and cross bussing our kids for the purpose of racial equality for greener pastures literally, a rustic farmhouse and all that went with it, long beautiful commutes and many wonderful stories. We are still in Vermont, but have since moved a couple of towns away, to a college town, where we have the best of both worlds. We aren’t quite so rural, have some of the cultural opportunities that we had left behind, and are but twenty minutes from a small city that offers us what city folk need, jobs and a few more amenities than found at our local mom and pop small town shops. Life is good! I had no clue that I was to become a tomato farmer when we decided to move to The Old Wilcox Farm. We had come from the city and were excited about our new life. Not wanting to appear too green at country ways, I moved into the garden just as I had moved into the old farm house. I first cleaned out the garden and then filled the space. The garden was so huge compared to anything I had known in the city, that it didn’t matter what I put in it. My only goal was to fill it. I only wanted to appear to be a real country woman. I found nothing wrong with buying my produce at the supermarket. Besides, we were renting and our landlords should be made comfortable with our care of their house and land. To my surprise I found pleasure sitting out on the ground in the garden playing in the dirt. The garden overlooked the lower barn, pastures, and orchard, all surrounded by woodland, a view that was breath taking. The other advantage of this endeavor was that no one else was interested in joining me. It appeared to be too much like work for my girls, and it soon became a place of refuge, a haven of my own. It was a quiet place, with no bickering or demands. Pulling weeds, I came to realize, was also therapeutic! With every weed I pulled, came satisfaction, like eradicating evel from the world. I filled my mind and heart with the spacious country view and air, so healthy and beautiful, so natural and right. Then I got out my old seed box, full of seeds that I had dreamt of planting, for I had always been a farmer in my heart. It was late enough in the season that I couldn’t be faulted if nothing came of my endeavors. And so I pulled weeds and planted by seeds. Although I had many seeds, I found that there was still three fourths of the garden empty when I had finished. Needing more therapy, I then decided to fill the rest of the garden with the small tomato seedlings growing wild to the side of the garden. They were the result of my landlord cleaning out her root cellar. She had thrown out her spoiled produce from the harvest of the year before. Then I planted and planted and planted the small tomato plants that I later counted and counted and counted. There were ninety-five in all. The rain came along with sun, and then more rain and sun and my seeds grew, though the real success were the tomato plants. They grew and grew and grew! At last our garden had become the envy of every gardener. We not only had impressed our landlords, but any who came to our farm visit or work. We hadn’t a clue what we were doing, but the garden became our joy. The little plants spread and grew into tomato trees. Their fruit was bountiful and voluptuously large. Though squeamish about bugs and worms, the tomato plants became like pets and I found myself picking off tomato bugs. Forgetting that I didn’t have my garden gloves on, I would pull off gross, disgusting intruders. They too were fat and healthy, like the fruit they wanted to feast upon. I was not about to have my little pets violated. I would be their loyal protector! I still had not realized that I had a tomato orchard and was a true farmer! I defended my crop and was becoming a real country woman, complete with dirt beneath my nails. Though my produce had true monetary value, for they were not just beautiful, but organic as well, I invested my wealth in our landlords, and neighbors and gained the respect and acceptance of our local Vermont village, not usually open to “flat-landers” like ourselves, though we had come from the mile-high city and our mountains bigger than these wonderfully green hills. Tomatoes were given away by the bag and box full, along with our bumper crop of pumpkins. At Christmas, I received a special gift of honor from my landlord, a true tribute to my tomatoes, that then filled my pantry shelves as well as filled my freezer: a lovely ceramic tomato dish. 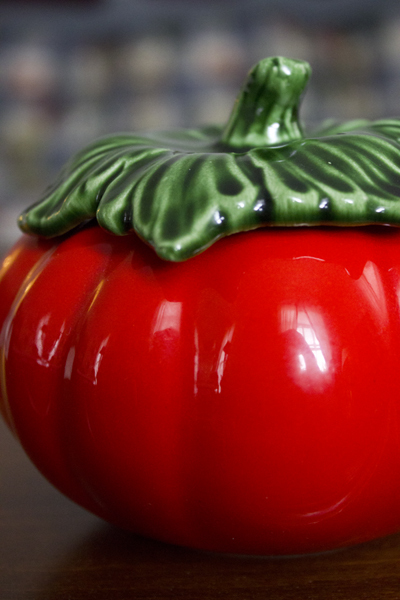 This is not just a dish to me, but a true trophy to commemorate my days of being a tomato farmer. With it came a note saying it reminded her of my tomatoes, that were like none she or I had ever seen before. I must give credit where it is due, for they had been hers and were no ordinary tomato plants. They were the largest and beefiest tomatoes and I was a real tomato farmer! This story is dedicated to Debbie K. of Bar Harbor, Maine, our landlord and friend. It was by her country garden inspiration that my first tomatoes grew and now my over-sized, plump tomato pincushions.